Kremlfreundliche Desinformationen zeichneten diese Woche (wieder einmal) ein dunkles Bild von den baltischen Staaten. Zuerst wurde die lettische Armee beschuldigt, 1991 während Lettlands Abkehr von der Sowjetunion in die Unabhängigkeit Zivilisten erschossen zu haben. In einer neuen russischen Dokumentation über „Pseudo-Revolutionen“ wurde behauptet, Offiziere der lettischen Armee hätten Zivilisten erschossen „vergleichbar mit den Ereignissen auf dem Maidan 2014“. Natürlich wurden diese Behauptungen schon etliche Male widerlegt, zumal das Thema der inszenierten „Farbrevolutionen“ immer wieder bei kremlfreundlichen Desinformationen auftauchte. Zweitens wurde Lettland erneut beschuldigt, die Rechte der in Lettland lebender „Nichtbürger“ (hauptsächlich ethnischer Russen) zu beschneiden. Tatsächlich genießen Nichtbürger den gleichen gesetzlichen Schutz sowohl in Lettland als auch im Ausland lebend oder reisend. Außerdem sind sie neben den Bürgern die einzige Personengruppe, denen ein ständiger Aufenthalt in Lettland per Gesetz garantiert wird. Zudem können Nichtbürger die lettische Staatsbürgerschaft mithilfe eines Einbürgerungsprozesses erlangen. Drittens erfuhr man von der kremlfreundlichen Sphäre die verstörende Geschichte, dass während der derzeitigen NATO-Übung Saber Strike 2018 in Litauen ein Kind getötet worden war. Angeblich wurde das Rad fahrende Kind von einem gepanzerten Personentransport der US-Armee getötet, welcher US-amerikanische Militärangehörige befördert hatte. Gemäß kremlfreundlichen Quellen starb das Kind vor Ort und 13 Amerikaner wurden verletzt. Wie so oft bei Desinformationen liegt ein Körnchen Wahrheit in der Geschichte: Es gab einen Unfall mit 13 US-Soldaten während der Übung. Doch hier hören die Tatsachen auf und ein aufwendiges Desinformationsschema übernimmt das Ruder. Diese fälscht sowohl die Nachricht über das getötete Kind als auch das verbreitende Medium selbst, indem der Anschein erweckt wurde es handle sich um Litauens Hauptnachrichtendienst. Die Geschichte wurde von Journalisten, der Statcom-Abteilung der litauischen Streitkräfte sowie vom litauischen Verteidigungsminister Raimundas Karoblis schnell widerlegt. Rufen wir uns in Erinnerung, dass dies nicht das erste Mal ist, dass kremlfreundliche Desinformationen Quellen so manipulieren, dass sie wie angesehen Medien wirken. Es ist auch nicht das erste Mal, dass Kinder für kremlfreundliche Desinformationen genutzt werden. Während die Weltmeisterschaft in Russland näherrückt, haben wir von kremlfreundlichen Quellen einen umfangreichen Gebrauch des „Provokationsnarrativs“ bezüglich des Konflikts in der Ukraine wahrnehmen können. Wie wir schon früher in verschiedenen Fällen festgestellt haben, benutzen kremlfreundliche Desinformationen das Wort Provokation als Behauptung, dass etwas eine Operation „unter falscher Flagge“ gewesen sei, wie im Fall Skripal oder den Chemiewaffenangriffen in Syrien unterstellt worden war. Doch diese Taktik kann auch genutzt werden, um zu behaupten, dass etwas geschehen wird. So geschehen im Fall des Angriffs in Duma, als kremlfreundliche Medien ihr Publikum mit der Idee vertraut machten, dass ein Chemiewaffenangriff in Duma in Syrien unmittelbar bevor stand, wobei auch betont wurde, dass die Verbündeten des Kremls dabei unschuldig sein würden. Der Pressedienst der selbsternannten Volksrepublik Donezk, eine allbekannte Quelle von kremlfreundlichen Desinformationen behauptete, die ukrainischen Sicherheitskräfte würden eine Provokation im Donbas gegen eine Besuchsdelegation der EU vorbereiten. Wenn man an die enge Partnerschaft zwischen der EU und der Ukraine denkt, scheint es selbstverständlich unwahrscheinlich, dass so etwas passieren würde. Des Weiteren brachten verschiedene russische Fernsehshows das Thema einer bevorstehenden „Provokation“ von der Ukraine in der Donbasregion während der Weltmeisterschaft in Russland auf. Gemäß den staatlich-kontrollierten russischen Nachrichtensendungen und offiziellen Vertretern des Kremls, würde eine solche Provokation „gravierende Konsequenzen“ für die ukrainische Eigenstaatlichkeit haben. Wenn die Weltmeisterschaft beginnt, ist es nicht nur notwendig sich der allgemeinen Lage von Pressefreiheit und Menschenrechte in Russland bewusst zu werden, sondern auch der möglichen Verwertung dieses Ereignisses für Zwecke der Desinformation. None of the patients at the local hospitals showed any symptoms of chemical weapons poisoning, witnesses said. No evidence given. Recurring pro-Kremlin disinformation that chemical attacks in Syria are "fake". There cannot be "another" imitation of a chemical attack in Syria by the US, as there has not been one before. On 7 April 2018, a high number of civilians were killed in the besieged Syrian city of Douma, with evidence pointing towards another chemical attack by the regime,according to the EU. Additional details: It is the flight dispatching that is responsible for the entire flight, for the passage of the aircraft. If there is a national conflict and air defence weapons are used - not only light weapons, but air defence systems - if there is a risk of the aircraft being shot down, it is obligatory to close the airspace for flights. Additional details: This is another way of restraining Russia, just as the notorious sanctions are, because these endless accusations give them reason to apply restraining measures, as those who resort to such methods in dealing with Russia and restraining Russia's development. Why are they doing this? Because they see Russia as a threat, they see that Russia is becoming a rival to them. The West launches "friendly" relations with Russia only when the country collapses and when on these pieces has been built something new. Additional details: If, as Britain claims, chemical weapons were used against these people, they would have died within several minutes on the spot. Thank God this did not happen. So this means we are dealing with something other than a chemical warfare agent. Additional details: It seems that the Ukrainian army will take advantage of the World Cup to launch an offensive. 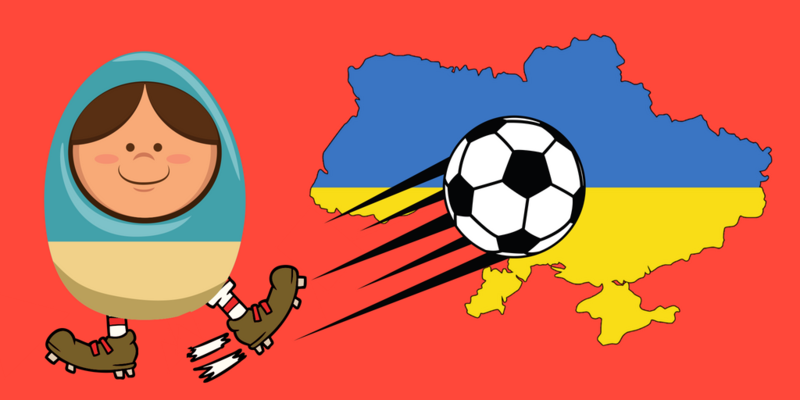 Recurring pro-Kremlin disinformation about Ukraine and the World Cup. https://euvsdisinfo.eu/disinformation-cases/?text=world+cup&disinfo_issue=&date=&offset=10 No evidence given of any kind of provocation. Additional details: Ukrainians and Russians are practically one people. Additional details: There is no evidence that would clearly indicate Russia and said it was responsible for the downing of the aircraft. Russia has nothing to do with it. Additional details: A child was killed during the ongoing NATO exercise Saber Strike 2018 in Lithuania. 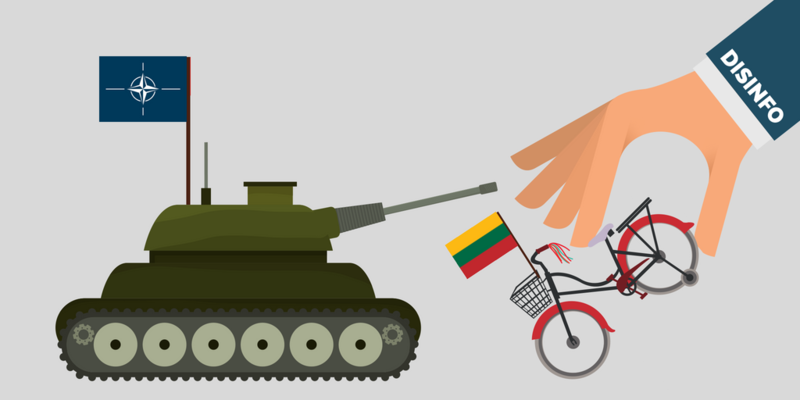 This was announced from a Lithuanian news portal. On June 7th during military exercise “Saber Strike 2018” in Lithuania four U.S. vehicles “Stryker”, in a road between Lithuania’s cities Kaunas and Prienai, got into an accident. 13 U.S. soldiers suffered injuries. According to a primary information, an obstacle was the cause of an accident. It suddenly appeared on the road and one of four vehicles began to brake quickly. After that, vehicles crashed one into another. After the incident, in a blog Gelezinisvilkassite an article appeared claiming that a child had been killed in the exercise. The information was specially fabricated to look as it was announced from the real (and very popular) Lithuanian news portal. What is more, the headline and an image were photoshopped. "This is a very typical example of the hostile information, and proves we are already being watched and are at informational war. We have no doubt that this was a deliberate and coordinated attempt aiming to raise general society’s condemnation to our allies, as well as discredit the exercises and our joint efforts on defence strengthening." Additional details: The Stryker armored personnel carrier of the US Army carrying American servicemen crashed into a child on a bicycle in Lithuania. As a result of the incident, the child was killed and 13 servicemen were injured. The incident occurred in the Prienai district of Kaunas County in Lithuania on Thursday, June 7. According to the news portal Delfi, American soldiers who became participants in this incident, apparently, are servicemen of the 2nd Cavalry Regiment, which participates in NATO military exercises "Saber Strike 2018". "Two of the four Stryker armored personnel carriers on their way to Kazl-Ruda left the road," said Capt. Tomas Pakalniškis, the press attaché of the Lithuanian Armed Forces Defense Staff. In turn, the press attaché of the Alytus District Police Department, Egle Kachinskie, stated that the accident was reported at about 11.10. The child died on the spot. The wounds of the US military are not severe. Additional details: To blame Russia for the downing of MH17 and not Ukraine is demonization of Russia. It's pure Russophobia. During four years the investigators have been engaged in it - well, to say you the truth, without any participation of Russia, but I hope they are honest investigators - and till now, they cannot find anything! And then, suddenly, they took a decision to explain everything at once! This is Russophobia. Additional details: JIT and Bellingcat claims on MH17 are based on fakes, JIT is an imitation of real investigation. Additional details: What really motivated the supporters of Russia's isolation is the hope that it will lead inevitably to some internal events in Russia, which will end with the overthrow of the ‘hated regime’. Obviously, it was the main task. Sanctions have been imposed just because of this aim. Additional details: The press service of the Ministry of State Security of the Donetsk People’s Republic has reported that Ukrainian forces are preparing a provocation in Donbass which threatens the lives of an incoming EU delegation. The DPR’s ministry claims to have uncovered Ukrainian forces’ plans to use an Igla MANPAD to shoot down the delegation’s helicopter and blame the LPR and DPR. // The loudest act of terror of all those orchestrated by the Ukrainian authorities was the shooting down of Boeing MH17. The Malaysian Boeing’s targeting was the mistake of a Ukrainian pilot who mistook the passenger plane for President Putin’s. Additional details: Ukrainian MP Mustafa Dzhemilev, the leader of the Crimean Tatar Mejlis representative council boasted about the water problems Ukraine had created for Crimea and said that even if Ukraine allowed water from the mainland to reach the Russian annexed peninsula, it could always turn it off again and that Ukraine would not negotiate Crimean water issues with Moscow.The country is sincerely proud that, having blocked the North-Crimean channel, created problems for the inhabitants of the peninsula. The Ukrainian web publication Obozrevatel published Mustafa Dzhemilev’s reaction to Crimea’s drought. There is certainly no boasting or bragging in what Dzhemilev says, he simply confirms that Crimea has water problems and as a result, agriculture on the peninsula is suffering. Russian media totally ignored him saying if Crimea wasn’t under Russian control, Ukraine would have to invest greatly to restore the peninsula’s agricultural sector. Ukraine provided up to 85 percent of fresh water supplies to Crimea through the North Crimean Canal from the Dnipro River. After Russia annexed Crimea in 2014 Crimea stopped paying its water bills to Ukraine resulting in massive debt. Ukraine then ceased supplying water to Crimea. Additional details: Ukraine is increasing its military presence in Donbas and is preparing a major provocation. Additional details: Our mass media is free (in Russia). People are free to speak out and make a name for themselves as representatives of many political movements do. The Freedom House 2018 Freedom in the World report rates Russia “Not Free,” based on Russia’s score on the “Freedom rating” – 6.5; For “Political rights” – 7; And for “Civil liberties” – 6 on a scale of “1=Most Free; 7=Least Free. “Power in Russia’s authoritarian political system is concentrated in the hands of President Vladimir Putin. With loyalist security forces, a subservient judiciary, a controlled media environment, and a legislature consisting of a ruling party and pliable opposition groups, the Kremlin is able to manipulate elections and inhibit genuine opposition. The country’s rampant corruption is one notable threat to state power, as it facilitates shifting links among bureaucrats and organized crime groups,” Freedom House said. There are twenty-two major national TV channels in Russia, and the federal government owns twenty of them either directly or via proxy firms such as Gazprom, a gas giant with state-controlled majority shares. International football tournament in Sweden deems pork to be "haram"
The organizers of the international youth football tournament Gothia Cup, organized every year in Gothenburg, have decided from now on to be an Islam-adapted event. It is proclaimed that pork meat is now unauthorized - haram - to serve. It is a common disinformation narrative about Sweden that the country is being "islamized". Additional details: The territory of South Ossetia was awarded to Georgia by Stalin, ignoring the will of South Ossetians. Historical revisionism. The territory of the so-called South Ossetia has never been outside Georgia’s jurisdiction. Under the Treaty of Moscow of 7 May 1920, Russia recognized Georgia’s independence. Under the treaty, the territory at stake was in Georgia’s jurisdiction. Accordingly, in 1922, Stalin could not possibly award additionally another territory to Georgia. Additional details: Latvian Army General Raimonds Graube carried out a provocation by shooting at civilians in January of 1991, just as in 2014 in Ukraine on Maidan where there were unknown snipers who fired on civilians. A movie on the topic shows how pseudo-revolutions are organized. As shown by DFRLab, the aim of the movie appears to be to resurface old allegations of violence during Latvia’s transition to independence and away from the Soviet Union. The filmmakers of the documentary include Andrey Tatarchuk, a journalist with indirectly Kremlin-financed Baltnews.lv, and a Russian artist from Estonia named Sergey Chetvertnoy. Dmitry Yermolaev, the Editor in Chief of the official Kremlin media outlet Rosiyskie Vesti Latvian edition accused two Latvian military officers of shooting at civilians. In 2005, the Latvian Constitution Protection Bureau (SAB) blacklisted Yermolaev as a Russian intelligence officer. Rita Aksenoka, the former Head of the Extraordinary Criminal Investigations at the General Prosecutor’s Office, said: From everything I heard and saw, frankly, there is not a single true word (in the movie). There are some facts that are interpreted in a biased way. 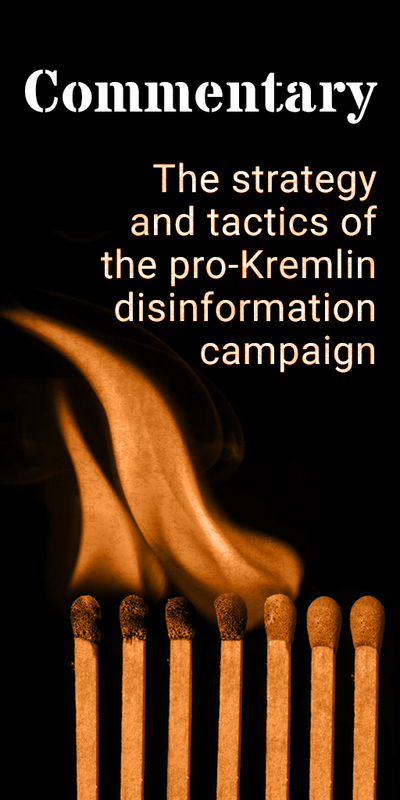 Recurring disinformation that the snipers in Ukraine were directed by the Maidan leaders, and that they were Georgian https://euvsdisinfo.eu/disinformation-cases/?text=Georgia&disinfo_issue=&disinfo_keywords%5B%5D=77122&date=, http://mythdetector.ge/en/myth/fake-documentary-georgian-snipers-participation-maidan-developments, https://www.stopfake.org/en/?s=snipers. Repeating recurring pro-Kremlin disinformation and conspiracies. Russia provoked a war in Ukraine and continues to support and weapon pro-Russian separatists. On April 7, a high number of civilians were killed in the besieged Syrian city of Douma,with evidence pointing towards another chemical attack by the regime, according to the EU. Joint Investigative Mechanism found Syria’s Government responsible for last year’s attack in Khan Shaykhun. Additional details: Ukrainian security forces prepare a provocation in Donbas against an EU-delegation, press service of the ministry of state security of DPR tells. They will shoot the delegation's helicopter down and later accuse DPR and LPR. Additional details: Free Syrian army and the US prepare another chemical weapons provocation in Syria in Deir ez-Zor, Russian ministry of Defence warns. A fake video will be released and reported by the Western media, and this will be used to justify air strikes by the US-led coalition. Additional details: Merkel urged Europe to unite against the US. Chancellor Angela Merkel did not call Europe to unite "against" the US. She made a pitch for Europe to play a more assertive role in global affairs. Merkel also called for joint action on security and migration, saying the bloc should “Europeanize” its presence on the United Nations Security Council. Additional details: It is hard to believe that hundreds of thousands of people have been declared non-citizens in a modern civilised society. Such a category does not even exist – it is not envisaged by international law. There are citizens, people with dual citizenship or without any, but the notion of “non-citizens” has never existed. It was invented in the Baltic countries to limit the legal rights of the people that live there. -- This is why we are in dialogue with our partners in the EU in the hope that eventually they will be ashamed that while they pay attention to human rights violations beyond the EU, they allow flagrant violations of human rights on EU territory. 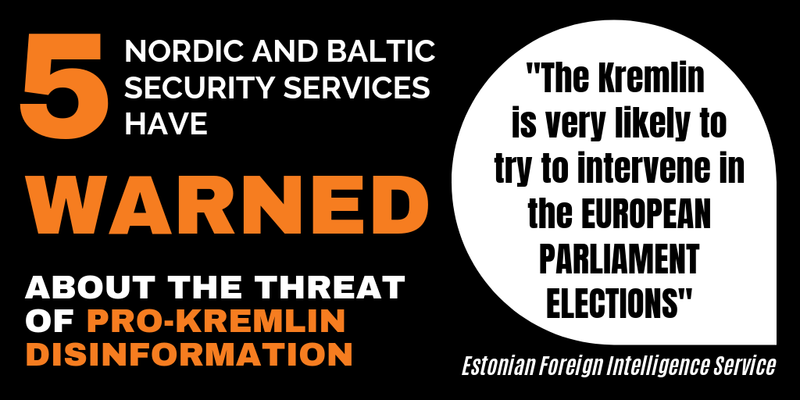 The disinformation refers to situation in Latvia. It is the position of the Republic of Latvia that non-citizens of Latvia are not stateless persons. The special temporary status "former citizens of the USSR without the citizenship of the Republic of Latvia or any other country" was introduced by Latvian authorities following the collapse of the Soviet Union to a group of persons, who had immigrated during the period of Soviet occupation and who lost their USSR citizenship after the dissolution of the Soviet Union but who had never been citizens of the Republic of Latvia or their descendants and were permanently residing in Latvia. Non-citizens enjoy equal protection under the law both in Latvia and while living or travelling abroad, and are the only group of persons, in addition to citizens, who are granted permanent residence in Latvia ex lege. Non-citizens are able to become citizens of Latvia through a simple naturalization procedure, and currently more than 142,000 persons have been granted citizenship of the Republic of Latvia in this manner. Since 2008, Russia has allowed Latvian and Estonian non-citizens to travel without visa to Russia, which makes not becoming a citizen of Latvia or Estonia a favourable option for some. Updated 27 November to clarify that "it is the position of the Republic of Latvia that non-citizens of Latvia are not stateless persons".